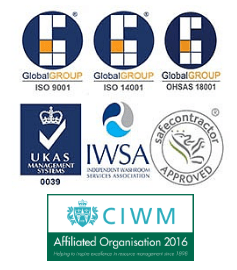 We are proud of our ISO 14001 accreditation. Sustainability is at the heart of our business. Environmental impact, as well as functionality and cost, are key deciding factors in all product design, waste management, packaging, and service systems. We seek to use recyclable materials wherever possible, without compromising safety or quality. Our washroom services help you to save energy and water usage whilst ensuring a clean and safe environment for your staff and visitors. Our innovative solutions reduce the amount of energy and water required for systems that are traditionally high-usage including urinal and WC flushing, hand washing, and drying. We ensure all systems work as efficiently as possible while never compromising on hygiene. This enables you to reduce costs, meet sustainability targets, and take care of the health of your staff and visitors. 80% of all waste in the UK goes to landfill which can lead to air, water, and ground pollution. We continually review and seek new development and technology that will make our services and our customers greener. An estimated 2 billion sanitary products including needles and tampons are flushed down Britain’s toilets each year. Many of these end up in rivers, the sea or washed up on the beach. At AHS, we are committed to the environment and your health. Our waste management solutions support the national Bag It Bin It campaign to promote the responsible disposal of personal products.